Stuff has a tendency to pile up; it's one of the laws of the universe. But that doesn't mean you have to sit back and let entropy make a mess of your space. 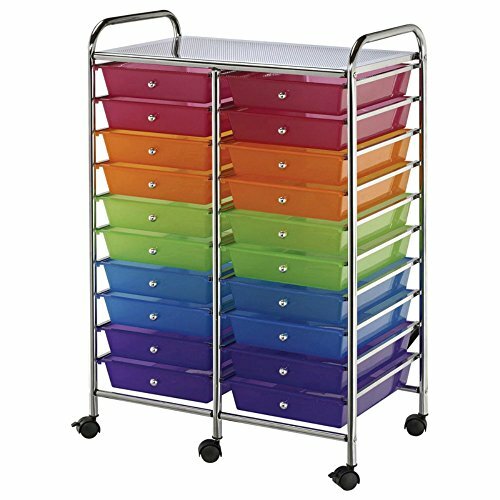 The Blue Hills Storage Cart with Multi-Colored Drawers is here to help you restore order, and add a splash of lively color while you're at it. It features a unique patented interlocking rail and drawer system that prevents the drawers from shifting off the rails. Molded stops on the drawers prevent drawers from pushing through the back. Four smooth-rolling casters (2 locking) allow you to move this cart about the room as needed. Choose from several size options to get just the amount of clutter-fighting organization (and enlivening color!) your space demands. Dimensions 3-Drawer Cart: 13.2L x 15.4W x 26H inches6-Drawer Cart: 13.2L x 15.4W x 32H inches10-Drawer Cart: 13.2L x 15.4W x 38H inches All small drawers measure 13.38L x 9.38W x 2.5H inches. All large drawers measure 13.62L x 9.75W x 5H inches. Each drawer has a 3-lb. capacity. With over 54 years of experience, Alvin is one of the primary sources for drafting supplies and drawing equipment in the country. Together with this core group of products, Alvin continues to meet the needs of multiple markets with its expanding range of fine art, hobby, and craft supplies; a large selection of drawing room furniture; a wide assortment of designed products; and its distribution of numerous national brands. Several size options available. Multi-colored drawers . Chrome-finished metal frame and drawer pulls . Interlocking rail and drawer system. Molded drawer stops. Each drawer has a 3-lb. capacity. Usable top shelf provides additional storage . 4 caster wheels (2 locking) .